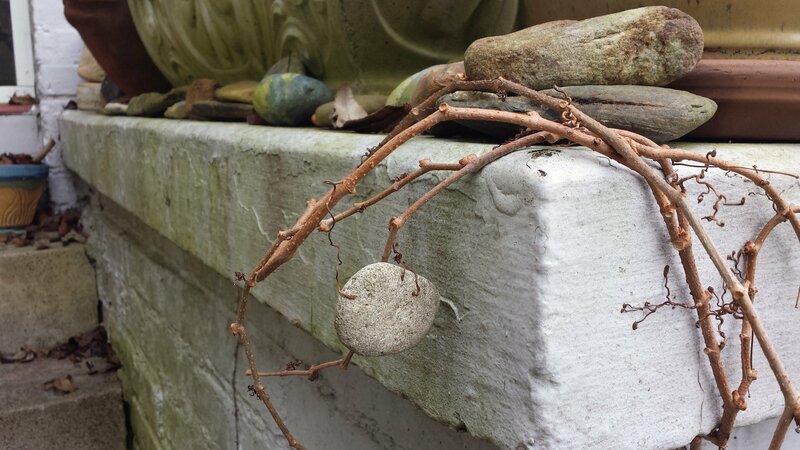 Sandy noticed this first – look what the Virginia creeper vine snagged from my rock collection at the front steps. 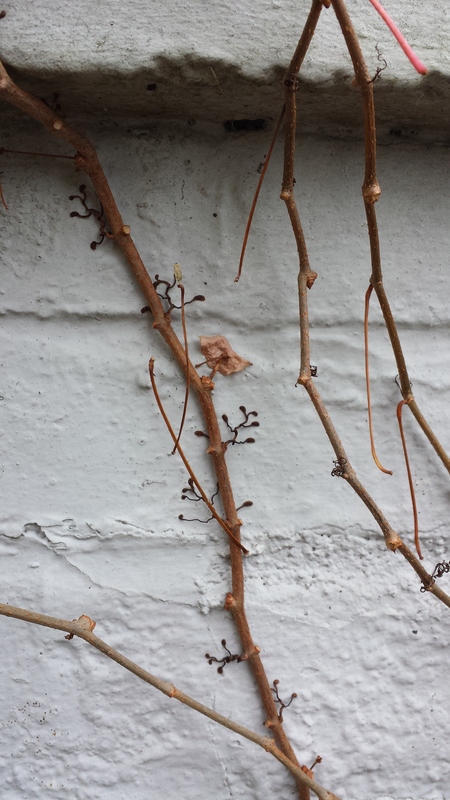 Normally I would tear this vine down after it loses its pretty red leaves but I’m going to see how long it holds on to its booty. Love those little feet. I’ve made random weave baskets from Virginia creeper vine before. This week has been fraught with emotions, since one of our students became so sick with anxiety that she had to drop out. Not only was it very sad, but I empathized so much. How many times did I think that this might be the time I would not be able to push through and get back to functional life? But I have, and I am grateful for it. When I was this student’s age, I self-medicated with lots of alcohol. That was not a good solution and not one that I choose these days. I know that I could not have gotten through graduate school at that age, despite having the smarts for it. However, I am in a good mood this weekend, so I hope that it is a permanent lift. 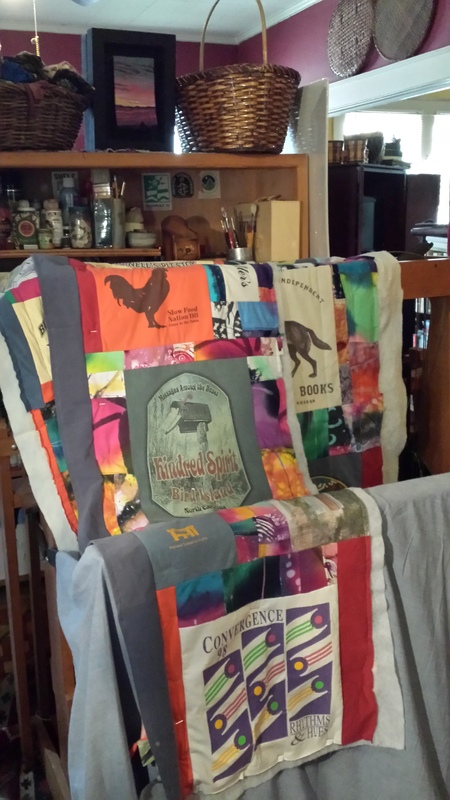 The t-shirt quilt hit a snag, quite literally. I think that I will get my Brother machine back out and see if it winds a Singer bobbin. My goal is to get all these panels put together somehow by the end of the day, even if it means with pins and hand basting. I want my floor loom and worktable free for other projects. There are too many distractions here and I need to focus. I need a cook and a maid! We are getting caught up on house cleaning little by little. Sandy subscribed to one of those meal prep services that come by mail. If it will teach him to cook and he takes over some of that it might be worth it. We’ll see. I’m picky about the sources of my food but this is his expense and something he decided to do on his own, and I grew weary of cooking a long time ago. Yesterday was a beautiful day after so much rain and I got into the garden and worked for a couple of hours, taking lots of breaks so that I don’t overdo it and undo my physical healing after many days of inactivity. I’ve gained several more pounds from my retreat to bed every night and eating too many sweets and peanut butter. 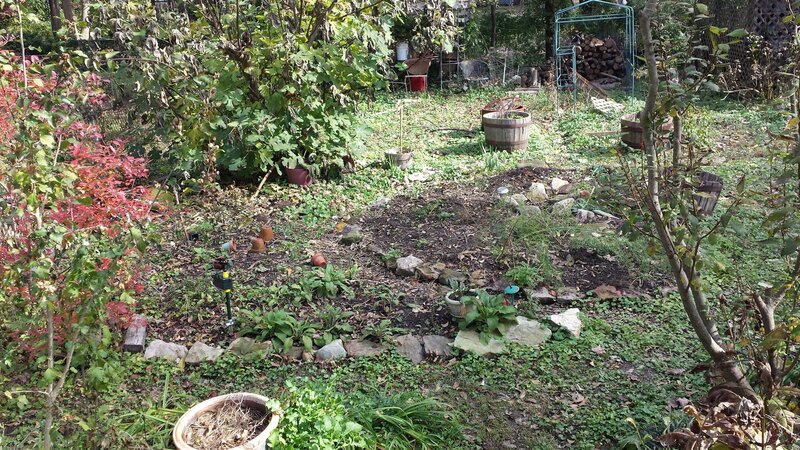 As I move these perennials out, a few will remain in my reconstructed hugelkultur bed. 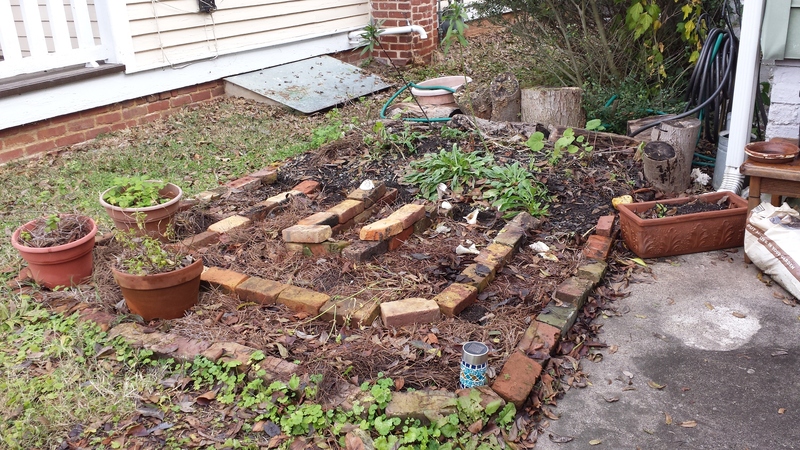 I am building it up and outwards where the potted plants were this year into a tiered bed for my culinary herbs, mostly. I’ll leave one hollyhock and a few taller flowers at the back. I have a pile of bricks that came from the chimney that fell down at the pre-Civil War homeplace at the family farm, and I decided to use them to make the terraces. I love objects with a story. Everything will require more fertilizer this year. The few vegetable plants that survived the groundhogs suffered from blossom end rot. I’m going to get that greenhouse set up again soon. I’ve sent an email to ask to rent a plot at UNCG community garden again for my beans and okra. Hopefully they don’t have a groundhog problem there yet. Thanksgiving is coming up and as usual we will celebrate Buy Nothing Day on Black Friday. We will drive to Lake Waccamaw and get together with my sister at her rental house if all goes well. It will be sad to drive along Canal Cove Road but we will check out the scene there. Lisa is still mulling over whether to replace the walls in her house and sell it or sell it as is. I heard that the house where we stay and love is irreparably damaged and will be torn down. My brother and his wife will probably join us for a meal on Saturday. I’m going to make my usual asparagus-mushroom-almond casserole. Man, my Internet connection at home has been SO SLOW lately. I don’t know why, so I’ll just blame it on the oligarchy. Maybe when my electrical work gets done it will improve. They are going to replace everything from the pole to the house and some of the wiring in the attic in mid-December in preparation for our twelve solar panels. Right now it is driving me crazy as I try to upload photos. I received notice that Flickr is going to start charging me fifty bucks a year for photo storage, and I feel rather helpless to do anything but pay it since I have over 10k photos and videos on it. It would take an enormous amount of work to quit Flickr without most of my photos on the blog disappearing. Oh well. At some point I may have to stop paying the fee to not have ads on the blog to make up for it.